This is a cute story with interesting characters, a fair amount of angst, and a decent romance. With a few exceptions, I thoroughly enjoyed it. There were a few questionable actions by the protagonists at the end that left me frustrated at times, but they weren’t bad enough to take away from the things I loved. What did bother me, though is the extreme number of typos in a professionally published book. To the point that they became distracting. RIGHT TEXT WRONG NUMBER is about two people who seem to be utterly wrong for each other on the surface, but deep down, they have more in common than either realizes. 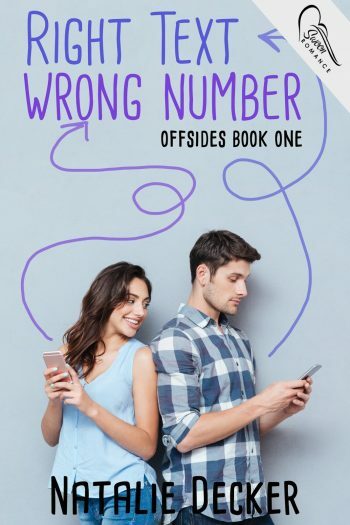 When Layla, a teen with dyslexia, accidentally texts the wrong number, she and the recipient of that text engage in a flirtatious screen-ship with no future. Until both of them realize they want more. The gentle and honest way the author addresses Layla’s learning disability is one of my favorite aspects of the story. Layla’s relationship with her identical twin sister, Juliet, is another favorite. As the mother of identical twins, the complex relationship of such close siblings is something I’d like to read more of in young adult fiction. The plot centers around the relationship of Tyler and Layla. In real life, they hate each other. Or at least that’s what we’re led to believe. But things are far from black and white with these two. Their secret texting life is something completely different. Without reality getting in the way, they’re able to communicate on another, deeper, level, and learn more about the other. Except they don’t realize who they’re texting. So many things can potentially go hilariously wrong, that of course they do. Tyler and Layla are complex characters with rich backstories and solid flaws that make them fascinating. Unfortunately, Layla’s ex-boyfriend, Adam and a few of the female characters came across as stereotypical and two-dimensional. The clingy girl in the second half of the story was especially so. Because this is Tyler and Layla’s story, I could ignore those secondary characters to a point, but they influence the actions of the main characters enough that they can’t really be ignored for long. 1. Angsty teen romance. My favorite kind of romance. This is a 10 on the angst scale. 2. Learning disabilities. The author handles Layla’s dyslexia with honesty and heart. 3. Twins. As the mother of identical twins, I love the relationship Layla has with her identical twin sister, Juliet. Although mine are far more alike personality wise than these two, their special bond rang completely true to me. 4. Juliet. The loveable nerd is so much like my daughter, I took an instant like to her and can’t wait to read her story next. 5. Texting first. I love the idea of these two getting to know one another through written words before the whole physical attraction bit could get in the way. A cute, angsty teen romance.